Tailfeather: Are you ready to drop? Toughwood: I think I may have dropped already! Bugsy: I may not be very conscientious, but I do object. Lofty: …including those flies circling your bottom. Victoria: I don't care if you're a hero or not, just concentrate on the getting back. Sergeant: Gentlemen you are the fliers of the FUTURE! Sergeant: [Holds face] The FAR future! Lofty: Any moment now, Gutsy will fly out and tell us the plan! Lofty: [the plane Gutsy was in explodes] Right then. Who has the backup plan? Bugsy: Oh you want the backup plan? Um... WE DIE! Yeah, that's the backup plan! Cufflingk: [preparing to torture Mercury] You want us to pluck out his feathers? Underlingk: And... heh... CLIP his wings? Von Talon: No, no, no, no! Worse. MUCH worse. Von Talon: We have ways of making you squawk. Mercury: Argh! What kind of birds are you? Von Talon: There will be awards, parades, and commemorative stamps! Charles De Girl: [to Valiant, Bugsy, Lofty, Toughwood, and Tailfeather] I won't lie to you - you will definitely be eaten by falcons. Lofty: Could you burp on cue? 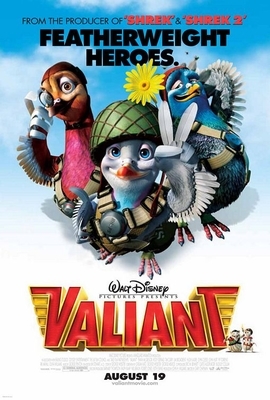 Bugsy: Yeah, I can burp on all the letters, not just Q.
Valiant: It's not the size of your wingspan that counts, no, it's the size of your spirit. Felix: [talking to Valiant about being in the RHPS] If it weren't for my wooden drumstick and this shrappnel in my poopdeck, I'd be out there right now! Bugsy: How did you find us? Valiant: Yes, um, enough about that. Bugsy: I've got a doctor's note! Felix: It's not the size of your wingspan that counts. It's the size of your spirit! Von Talon: I'm a vegetarian. Mercury: And yet you wear a leather cape.